Lex is using his mind exploration technology to learn about Superman's true identity from Tess, still trapped in his mind, when Otis interrupts the session to advise him of a problem. Out in the streets of Metropolis, a Dr. Jones who wants to be called Psimon is looking for Lex, whose Project Ares has apparently given the diminutive doctor his purple skin, an oversized and glowing-through-his-skull brain and some kind of indeterminate psycho-molecular power. Psimon is not convinced a peaceful resolution to this situation is possible and shoots a purple blast at Lex, whom Superman saves and proceeds to lecture on the perils of not being prepared to defend himself from the ghosts of a past he can't remember. Superman then returns to finish with Psimon, who proves to be able to act more quickly than Superman thanks to his enhanced synaptic firing. But there's no time for gloating, Psimon, "There's always been someone faster." Impulse is back. First round (of ice cream) is on him. Story - 3: There were a lot of little things about this issue that I could have spent sentence after sentence criticizing, very little things like the black text boxes in the "Lex's mind" scene (they didn't help me join Tess in there) or the slap-my-knee-I'm-dead-from-drug-overdose "speed is a killer" pun from Bart to more substantial things like the bizarrely avuncular conversation about Lois and Clark between the two cops (I thought it was bizarre for being so friendly and sympathetic - avuncular, in a word). I've decided, though, not to do that. I'd even already written a lot of those prenominate sentences but have since discarded them. Forget it. Let's just cut to the chase: this issue was all over the place, unable to strike a solid balance between back story (all the stuff with Lex, which we already know) and forward motion - the forgettable mini-villain, the brief exchange between Superman and Lex (where Superman is Superman, I'm happy to report) and Bart's arrival. It's an introductory chapter, so you've gotta do both: how you got to wherever you're at and where you're going from there. Perhaps if Miller was less concerned (than he seems to me to be, at any rate) about brand-new readers - as evidenced in the frequency with which he retreads stuff we already know and, more gratingly, those name labels - his transitional chapters would leave me eager for whatever's coming next. This one doesn't. I like Bart but not stupidly modified ancient puns about the dangers of amphetamines played for giggles in his dialogue. I love Lex but not the mixed metaphor of a "mind DIVE" you enter and exit from through a door. This episode served precisely two functions: to remind us about that red-door-in-Lex's-mind stuff from the show and to bring Impulse in. Everything else was filler, some of it convincing, some of it not. For me, that means meeting in the middle at 3 of 5. Art - 4: This art is wasted on this story. It has warts, especially some inconsistency in the faces (though the title has seen worse), but the introductory panels in particular are nicely evocative of the dark and fragile state of Lex's mind. Too bad they're wasted on a sequence that brings us absolutely no new information at all. Everything we are shown here was already conveyed, much more economically, at the end of the last issue. It's the "What about the new readers?" problem again. It's hurting this book, big time. 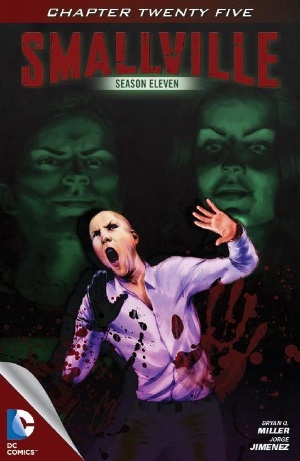 Cover Art - 4: I really like Cat Staggs' work, and this looks like a cover I would totally like, but unfortunately the faces of the two ghosts in the background are obscured and I'll be damned if I can find a good full-sized version of it online. I can see it all in "the store" but it's pretty small. One of them has got to be Tess, the other I'm guessing Lex's mother. Probably I'll find something after it's already been posted, but either way I'm not giving out full marks but I'll be on record pinning that on the nameless production person responsible, finally, for the way the cover fits on the screen. UPDATE, RIGHT BEFORE SUBMITTING: Logged in to comiXology from my actual computer, which I never do, but otherwise d-uh and HAHAHAHAHA. Ok, so the ghosts are Clark and Tess. I had thought Clark was Tess and Tess was Lex's mother. Well, that's cool. But Tess doesn't really look like Tess and, even though Clark does look off in a way that you could happily attribute to being "seen" through the filter of Lex's own perception, it's even more obvious now how poorly they fit that art to the tablet. Thus no change to my grade.